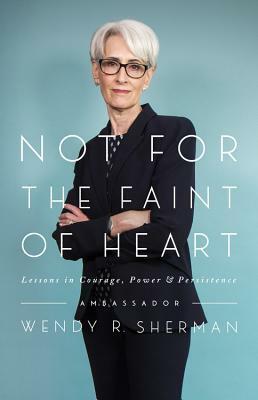 Distinguished diplomat Ambassador Wendy Sherman brings readers inside the negotiating room to show how to put diplomatic values like courage, power, and persistence to work in their own lives. Few people have sat across from the Iranians and the North Koreans at the negotiating table. Wendy Sherman has done both. During her time as the lead US negotiator of the historic Iran nuclear deal and throughout her distinguished career, Wendy Sherman has amassed tremendous expertise in the most pressing foreign policy issues of our time. Throughout her life-from growing up in civil-rights-era Baltimore, to stints as a social worker, campaign manager, and business owner, to advising multiple presidents-she has relied on values that have shaped her approach to work and leadership: authenticity, effective use of power and persistence, acceptance of change, and commitment to the team. Not for the Faint of Heart takes readers inside the world of international diplomacy and into the mind of one of our most effective negotiators-often the only woman in the room. She shows why good work in her field is so hard to do, and how we can learn to apply core skills of diplomacy to the challenges in our own lives. Wendy R. Sherman is Senior Counselor at Albright Stonebridge Group and former Under Secretary of State for Political Affairs. In January 2019, Ambassador Sherman will join Harvard Kennedy School as a professor of the practice in public leadership and director of the School's Center for Public Leadership. She serves on the boards of the International Crisis Group and the Atlantic Council, and is a member of the Council on Foreign Relations and the Aspen Strategy Group. Ambassador Sherman led the U.S. negotiating team that reached agreement on a Joint Comprehensive Plan of Action between the P5+1, the European Union, and Iran for which, among other diplomatic accomplishments, she was awarded the National Security Medal by President Barack Obama. Prior to her service at the Department of State, she was Vice Chair and founding partner of the Albright Stonebridge Group, Counselor of the Department of State under Secretary Madeleine Albright and Special Advisor to President Clinton and Policy Coordinator on North Korea, and Assistant Secretary for Legislative Affairs under Secretary Warren Christopher. Early in her career, she managed Senator Barbara Mikulski's successful campaign for the U.S Senate and served as Director of EMILY'S list. She served on the President's Intelligence Advisory Board, was Chair of the Board of Directors of Oxfam America and served on the U.S. Department of Defense's Defense Policy Board and Congressional Commission on the Prevention of Weapons of Mass Destruction, Proliferation and Terrorism.